Henry Hoobler and his family are off on holiday – but Henry would rather stay home with his Nonna. There are lots of scray things about a camping holiday at the beach – sharks, spiders, snakes and blue-ringed octopi. But the thing he is most afraid is the new bike he got for Christmas, which is strapped to the trailer. Everybody wants him to ride it – but Henry is scared he’ll fall off. The Grand Genius Summer of Henry Hoobler is a feel-good story about what it the meaning of bravery, friendship and family. As Henry tries to summon the courage to get on his bike, he navigates a new friendship with Cassie, who lives in the holiday park, and conquers other fears, including helping his little sister find a lost pony in the middle of the night. He also observes those around him learning new things and taking on challenges of their own. With laughter, moments of poignancy, and lots of feel-good moments, The Grand Genius Summer of Henry Hoobler is a treat. Pete is off on a bush camping trip with his Grandpa, whose name is also Pete. Both of them are excited about the prospect of finding a gold nugget with Grandpa’s super duper new metal detector. But as well as looking for gold, the pair are spending time together – they play jokes, they sing songs, and Grandpa cooks his speciality – curry. Going Bush with Grandpa is a lovely story of the friendship and connection between two generations of a family. 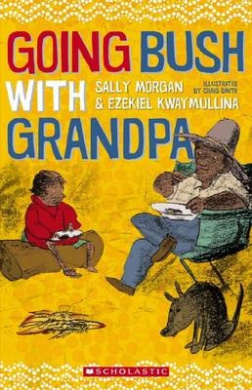 Pete and Grandpa share a special bond and the reader is given the sense that the real nugget here is that connection – though they’ll also hope, along with Pete, for a gold nugget to be found. With text by Sally Morgan and her son Ezekiel Kwaymullina, and illustrations by Craig Smith on every spread, the story is accessible to readers in early primary years. Available from good bookstores and Sally Morgan and online.